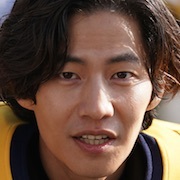 During the summer of his junior year in high school, Woo-Yeon (Kim Young-Kwang) spends his time getting time into fights. He isn't interested in studying. He then meets new transfer student Seung-Hee (Park Bo-Young) and falls in love with her at first sight. Seung-Hee though isn't interested in Woo-Yeon. To avoid the other male students, Seung-Hee and Woo-Yeon pretend to date. Seung-Hee also asks him to stop fighting. He keeps his promise and their relationship develops into a real romantic relationship. One day, Seung-Hee calls Woo-Yeon and tells him to take care. She then leaves town. 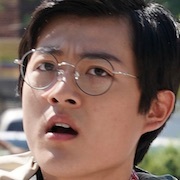 Kang Ha-Neul was first offered the lead male role, but declined. Filming began September 18, 2017 and finished December 4, 2017. 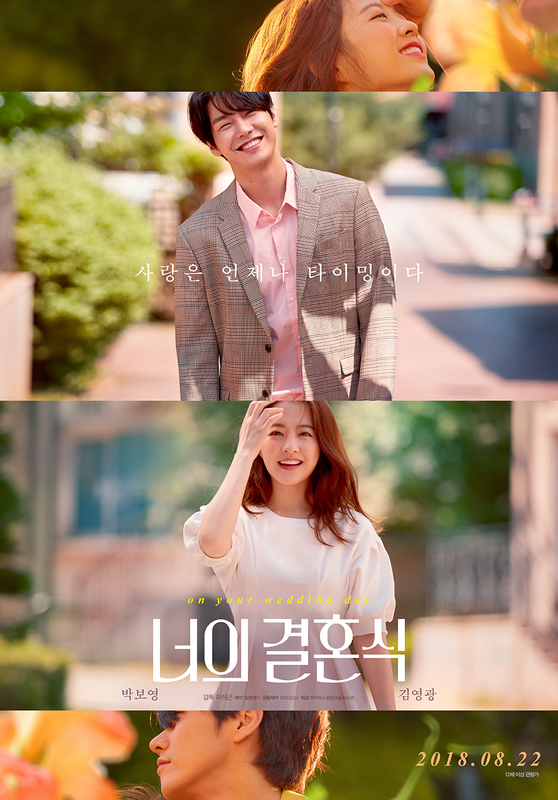 Teaser poster and still images for movie "On Your Wedding Day." Mee Feb 24 2019 12:19 am The story is great, just a sad ending but lesson learned. It could have been better that despite of their struggle to keep the relationship going they should have got back together. Roadman K Feb 17 2019 1:18 am I felt sorry for the girl and not Yoon as he was a bit stalkerish throughout the story while pursuing her I.e throwing the flowers at the car and the uni exam he got his mate to take that picture . I don't understand why he had a rich girlfriend and a chicken shop job and he had to throw that all away for her ? She only liked him because of the yard bit when the scaffolding fell down . I agree with some people that she didn't love him that much . To an extent she is also partly to blame I don't think he was like her dad who was violent and drunk so she should have taken a break in Belguim then come back and start over . Sojib Feb 08 2019 6:01 am To be honest I'm very sad and heartbroken. I can't blame the girl though. At first I thought the boy's love was pure. But he should not be upset for not getting a job immediately. But I don't know if he really believe that, or just was in his restless mind. But if he didn't really mean it. Then he should have done some effort to make it up for her. Go to Belgium and surprise her. He could have even send regular mails. Or something like that. But he didn't do anything. So he lost her. Gary Jan 26 2019 11:32 pm It's so realistic movie. Actually at least we want a happy ending in movie where boy and girl get marry because in life many love stories end badly. It was a little sad at ending but realistic. A good movie ? Ali Jan 21 2019 2:44 pm Love the ending, very realistic. tutu Jan 17 2019 9:40 am As a Bo Young fan, I was looking forward to watch this. But, despite of some awesome performancr from Bo Young and Young Kwang, I think this movie could be better. It was a good movie, but if I to compare it with some her previous movies, it lacks of the "UMPH" factor, idk, I just feel that it need a little bit more kicks. They could dig deeper on the couple's feeling.. but thats just what I thought. 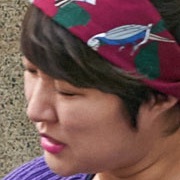 Very realistic choice on Sung Hee, some people call it selfish, but I'd honestly do the same thing if I were her. Why not lee kwang soo in lead male.. maybe.. Tea Dec 18 2018 9:22 pm I kinda hated the ending.... in my opinion, I think it was seeing hee's fault for woo yeon's lonely life. Dramalover Nov 07 2018 11:08 am i love this drama so much!! but the ending make me so emotional and crying so much! the plot twist is fun. but i prefer happy ending! *sobs* im literally crying while typing this comment..can they have be a partner again in other drama/movie. make it happy ending and add aine comedy romance just how their characther in the movie. 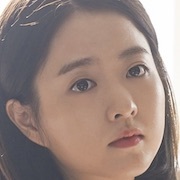 im a big fan of Park Bo young!!!! Dee Nov 03 2018 3:11 am Korean version of ‘500 days of summer’? Iixxx.. Nov 03 2018 1:27 am @Njj for a while i think seunghee is a bit selfish,prhps its bcs wooyeon didnt tell her all his sacrifice he made to her, but their love isnt easy,. After all its like wooyeon love her that much, sure its not his false. *seriously wht im gonna say,i feel lost. Lol. Daisy Nov 01 2018 8:17 pm Just a so-so movie... given that China and Taiwan have made similar types of movie that will make it hard for you to move on after watching. This one was just light to watch and they could have digged deeper with the feelings. Vinayak Oct 31 2018 8:27 am there is a song in the about smile , he sings for her, can anyone tell me the name of thaat song? Njj Oct 27 2018 7:51 pm I just watched this movie and it was really great but I didn't like the personality of seung Hee I think she didn't love woo yeon that much and I think she is selfish, I mean woo yeon did everything for her, he studied so hard and went to college just to be able to see her, he got injured and lost his opportunity to have a job because of her, when she had boyfriend she didn't leave him for woo yeon but on the other hand when woo yeon had a girlfriend he broke up with her immediately. Also when he said he regretted meeting her we all know he wasn't sincere and wasn't himself, he was sad and tired and she knew that but she left him and went to Belgium and when she came back she was getting married, she never gave him a chance she never considered going back to him because he wasn't that important to her. I think that's what happen when you love someone more than they do I really feel sad for woo yeon but overall the movie was so great and young Kwang was awesome as always. Ela Oct 26 2018 4:30 pm I was expecting a lot more after seeing photo shoots of the couple. I felt like the movie touched the surface of their chemistry, so I hope they work together again! Overall, the movie was okay. Good storyline, but I felt like something was still missing (maybe because I’m used to 16+ episode kdramas). I appreciated the ending, contrary to popular opinions. It’s realistic and a good lesson. I would recommend it if you have some time to enjoy a short, cute but realistic movie. Angela Oct 25 2018 7:03 pm Just had to come here after finally watching it!!! And just had to say that it was beautifully written and realized. Very light movie yet super relatable. It's unconventional ending compared to kdramas broke me since I'm used to safe endings of happily ever afters but really got me reflecting on life, relationships, pains and happiness. A- Oct 25 2018 1:28 pm I need something happy ASAP. ??? 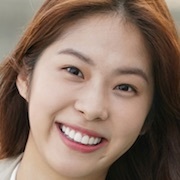 Agil Oct 25 2018 10:17 am nice movie just love all of boyoung movie, the story kinda look alike You're the apple of my eye. natasha Oct 25 2018 6:39 am it's a movie based on reality. just realize that some people are destined to meet and change each other's life. but some people are not meant to stay with us forever. they're just passing by to teach us a lesson that's why they're here. it's worth watching. N Oct 15 2018 1:09 am I watched this movie knowing that the ending is not a happy ending. I already know that this movie does not have a happy ending because of the title itself. But still, it was worth to watch. 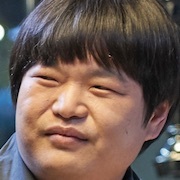 I wish that there is a man like woo-yeon haha. I mean, i really like his personality here. Though he is sometimes childish, he is still cute. While watching this movie, I laughed, I cried and I fell in love. It was really worth to watch. Taengs Oct 12 2018 10:44 am The story was heart fluttering and beautiful, but the ending...... For you guys to judge. yeah Oct 02 2018 11:33 pm I watched the movie even though there's no english sub. But then i cried ??? at the same time I laughed???. I'm thankful because I understand korean language a little. What a wonderful movie but sad ending. ?????? Tsulli Sep 22 2018 10:53 am I saw the film today and overall it was warm, funny(on most parts) thanks to effective punchlines and the phasing is great. Bo Young is wonderful as always and for Young-Kwang, it's the first time I saw him and he's great and handsome. Anyway, make sure to bring friends with you and a tissue if you're weak hearted and water. (Trust me, you'll need these 3 for the ending). pid razzly Sep 11 2018 3:35 am I think the male lead is not going to marry the female lead coz there is the role for Seung-Hee's husband..
Yulji Kim Aug 27 2018 10:21 pm When this kind of guy who follow you and really like you ???? anna Aug 27 2018 7:46 pm Is this similar to You're the Apple of My Eye? Susi Jul 23 2018 9:59 am I can't wait for this movie.. i think itll realy be cute and lovely ..
Syeol Jun 15 2018 12:15 pm When exactly this movie will release? I wait since 2017 ? Haniismiling May 07 2018 4:41 am WAIT! They will reunited after Hot Young Blood then!!!! KYK + PBY are super amazing at their crafts and I have appreciated all their hard work and efforts as well as their engagement and interactions with their fans. Good work guys, thank you always...FIGHTING! hadi Jan 19 2018 10:59 am More magazine feature for Your Wedding promo please please please Lee Seok-Geun please Please( park boyoung )be in Oh Boy again for Your Wedding promo please! Micah Dec 06 2017 4:35 am OMG! Young kwang oppa is much taller than our cute bo young.. this is going to be another cute romantic drama... cant wait to watch this!!! lang Nov 24 2017 11:36 am Noona. You and Park Hyung Sik are the best on screen couple aside from the SongSong couple. Hoping for you and PHS oppa to become reel to real. ? I love you both. I didn't recognize you were the one at Scandal Makers haha you're acting skills have leveled up, from SM to SWDBS. Hope to see you and PHS again in another drama series or movie. ? uj baby Sep 25 2017 4:29 am Two talented actors. Looking forward to the movie. goodday3105 Sep 23 2017 1:31 am pleasseeeeeeeeee looking forward to this movie. Lets support Park Boyoung !!!! Boyoung♥️fromIndia Sep 21 2017 12:03 pm Loved them in hot young blood...... Fighting!!!! vafa Aug 21 2017 2:14 pm please Kang ha neul and Park bo young are brought together in a movie .